Coll. No. 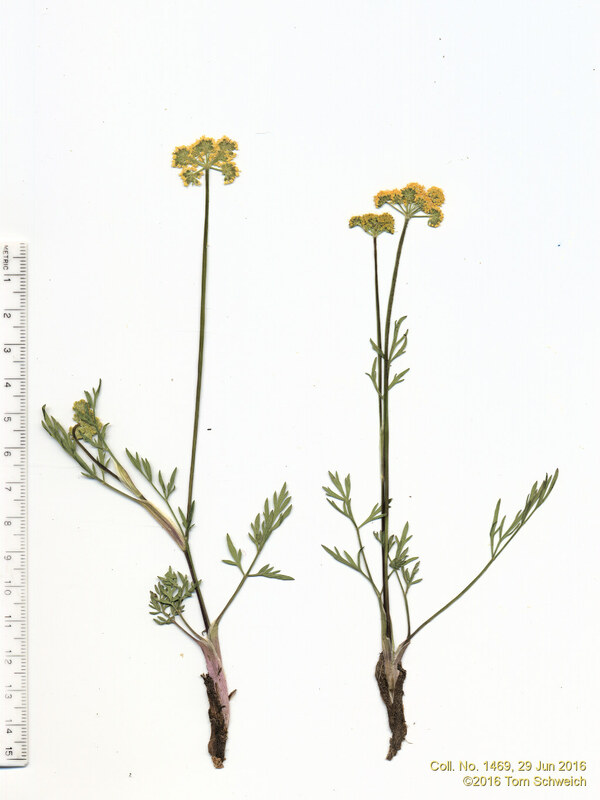 1469, 29 June 2016, characters observed: Perennial herb, to 15 cm., glabrous throughout, except very slightly scabrous at top of peduncle and on ribs of some rays; Pseudoscape, absent; Leaves, basal and cauline, 40 mm. × 25 mm. wide, obovate, compound, leaflets, #7, ultimate divisions narrowly lanceolate; Inflorescence, compound umbel; Involucre, bracts, 1.7 mm., linear (but not pinnafitid); Rays, ascending-spreading, ±equal; Involucel, bractlets green, inconspicuous, 1 mm. ; Corolla, petals, #5, 1 mm. × 0.6 mm. wide, yellow; Stamens, #5; Filaments, recurved; Ovary, glabrous; Stylopodium, absent (? ); Fruit, unknown. Field Notes: Coll. No. 1469, 29 Jun 2016. Other photos about Species or Apiaceae Cymopterus lemmonii.